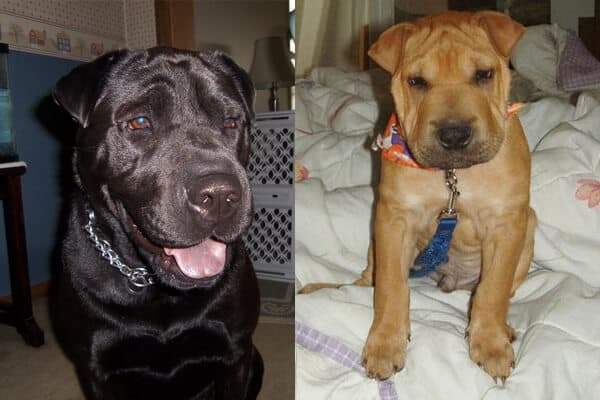 Why the Shar-Pei Lab Mix Will Make the Best Dog for You! Do you want a committed and loyal dog? A dog who’s good with kids? A dog that’s low-maintenance? The Shar Pei Lab Mix (also known as Lab Pei) is a mixed-breed dog (du-uh!) with one parent being a Labrador and the other a Chinese Shar-Pei. The medium-sized dog looks similar to a Labrador retriever with heavy wrinkles and loose skin like its Chinese parents. There are so many questions and considerations! I personally love to do research before bringing a dog to my family so that I can take care of it and treat it right. Let me share a few things about the Shar-Pei Lab Mix (aka Lab Pei) that’ll help you get to know the dog better. From the looks point of view, the Shar-Pei Lab Mix looks more like its Labrador parent. The dog is a medium-built and weighs between 40-60 pounds. It has large overlapping ears, big almond-shaped eyes (like a Lab parent) but has wrinkles and loose skin (like the Chinese Shar-Pei). It has a harsh and rough coat and has different colours like black, brown, chocolate, white, etc. The Shar Pei Lab Mix has an average lifespan around 8-12 years (but I know people whom have Lab Pei’s grow to 14-15 years old. So it also depends on how well you take care of your dog). Basic Behavior Traits: What am I Getting Into? Every breed has different behavior traits and you must get a dog that suits your lifestyle and preferences, because getting a dog is a long-time commitment. The Lab-Pei inherits traits from both its parents — The happy, playful and loving Labrador retriever and the rough, confident, strong-willed Chinese Shar-Pei. Shar-pei Lab Mixes are affectionate and put you before themselves – an unconditional love and care. But they will want you to reciprocate the same love from time to time. This is something that they’ve got from their Labrador side. These dogs aren’t too demanding and make the perfect pet for someone who doesn’t have a lot of time to spend with the pet. These dogs are protective towards their owners but aren’t aggressive toward strangers. They’ll give a warning bark if they feel insecure in a situation, but won’t attack unless provoked otherwise. The Labrador has the reputation of being good with kids, and the same goes for the Shar-Pei Lab Mix. They socialize well with kids and don’t harm them. This is a trait that they picked up from their Chinese parents. The dog can adapt well to new homes and families, and thus, is perfect for you if you move a lot. The dog loves to run around and play and is moderately active in and around the house as well as outside the house. The dog is known to destroy its toys, so you should get him something durable like Kong Tire Chew Toy or Nylabone Chew Toy. How often will I be taking it to the Groomers? And What About Walks ? The Shar-pei Lab Mix has minimal shedding. It sheds about twice a year, like the Labrador but doesn’t need to be groomed every few weeks. You should give your dog a bath every few weeks (I’d say every 3-5 weeks) so that he’s nice and clean. You can use Shampoo and Conditioners like the OxGord Natural Shampoo and Conditioner. Since the Shar-Pei Lab Mix is a medium dog, it tends to be on the heavier side (about 40-60 pounds) and needs constant exercise, so you’ll need to take your dog on walks about twice a day. Since the Lab-Pei has one Labrador parent, they can get lazy when they put on weight, so keep them moving! Studies have shown that mixed-breed dogs are actually easier to train than purebred dogs, so you don’t have to worry a lot about training them! ● Be confident: Since the Lab-pei is a mixed breed, it can be strong-willed and independent like its Chinese Shar-pei parent. The Shar Pei Lab Mix puppy can be cute, but the dog needs a confident master who can give strict commands or else they take over. Be careful not to overdo it or the dog will develop behavioral problems! ● The dog is good with verbal and hand commands: You can train the dog to respond to both, verbal as well had hand commands. My tip would be that you start giving them both verbal and hand commands together. If you know dogs, you know the one thing they love more than playtime, food! My dog just goes ballistic when he sees food, I’m not even exaggerating. The dog is active one and needs a rich diet high in protein, but remember that the dog should not be overfed as they put on fat really quickly and tend to become lazy. You should feed the dog 2-3 cups of dry food per day. There aren’t any brands that sell foods made specifically for the Shar-Pei Lab Mix, I recommend you get your dog food made for Labradors (since they are half labs anyway). My picks would be Royal Canin Breed Health Nutrition for Labradors and EUKANUBA Dry food for Labradors. As if that’s not enough information…. Do I need to look out for any Medical Concerns? Take your dog to the dentist because this breed had teeth that attract tartar buildup and need regular cleaning. You can regularly brush its teeth yourself as well by using dental kits like Sentry Petrodex Kit or Nylacare Advanced Oral Care Kit. Feel dog regularly for fatty tumors, they are usually benign but do keep a look out for them and get them checked out. If you’re living in dry regions then you should keep in mind that the dog has troubles with dry skin, so do apply fish oil or coconut oil to relieve the skin. If the dog has extremely dry and itchy skin, then treatments like Pure Paw Nutrition Treatment Oil or Alpha Pet Zone Coconut Oil can be helpful. The dog is susceptible to ear infections, so keep them clean! To sum everything up, the Shar-pei lab mix is a loving, caring and affectionate dog that are good with kids. They aren’t high-maintenance but love to go on long walks and are playful. They can be aggressive with toys so you should get sturdy toys like Kong Tire Chew Toy or Nylabone Chew Toy for them to play with. ● They shed about twice a year, but you should shampoo them regularly. ● Their diet is similar to that of a Labrador’s so you can feed them foods like Royal Canin Breed Health Nutrition for Labradors,EUKANUBA Dry food for Labradors, etc. Do you have any more concerns and questions? Did I miss something you feel is important? Leave a comment down below! The shar-pei looks JUST like my Lab! They’re so cute and adorable ? i am looking to buy a dog and have shortlisted the lab pei. i want to know how long they live. Thank you. The life expectancy of the average dog is about 12 years, with a typical range of 8-16 years. I think ,Quality of life is always more important than quantity. I have also seen dogs really suffer in their later years and the time just comes when you are no longer hoping they will live forever. Enjoy the moment. Gloom and doom thinking will only be passed on to your dog. while sites say 8 to 10 yrs….even up to 12. My Lab Pei , Rusty is 21. I got him in 2002 and the nurse I got him from said he was 5yrs old then. i own a lab and am thinking about getting a lab mix. will they get along okay? one of my friends has a mix and he really doesn’t like other cats/dogs… i’m confused…. Depends on what the mix is…..and how the animals were socialized. While a Lab Pei is an amazing dog in its own skin even they can be wrecked by isolation…..or cruel handling. But I must say that in the times my Rusty has been tested he has been alert to strange dogs and people but has never been the aggressor. He was very strong and fast and smart when young. (21 now so age has made him more woobly) A pit bull once tried to attack him and he grabbed its muzzle in his mouth and held the pit until we could rescue him. sir is shar pie in black. ? Yes I believe the Lab Pei is an iltimate family dog. .with some room to run …you are a fool. Rusty has been the best dog I have ever owned! If you contact me I would be happy to share pics and info on my beloved dog. My LabPei is 7, going on 8. I adopted him from the local shelter. TLDR: Best dog I have ever owned, and definitely will be looking in to this mix again once my boy passes. I have never met a more fiercely loyal, and protective dog. He was abused so he is very wary of strangers. His bark is bigger than his bite, but if he feels the need to be protective (a friend snuck up on me while we were walking, and scared the lights out of me) and will snap out of defence/protection (no teeth to skin contact). They say you can’t teach an old dog new tricks… well this guy picked up many commands and behavior training ( I.e. don’t jump on the door, just sit and bark when you want to come in). And I have never seen a dog calculate how high to jump to get through a bent fence. He is good with kids, most likely from prior events before me adopting him. He is a totally affectionate goof ball and acts like he is 9 months old. He has tons of energy but also loves to sleep in and relax on the couch. In terms of health he is in great shape. All though he does have horrible seasonal allergies (in which he will live on Benedryl to counter the red eyes and itchy skin in the fall and spring) and gets an ear infection every new season.